There are a couple of old automobile manufacturers that went by the name “Austin.” There is the well-known British Austin – the one who built the Seven and the Mini and died slowly during the decades-long BMC/Leyland “let’s ruin the British auto industry” debacle. Then there was “American Austin” which became American Bantam in the 1930s. But before these, there was the Austin Automobile Company of Grand Rapids, Michigan. It was founded in 1901 – five years before Austin of England. The Model 60 was the flagship Austin model when it was introduced. It’s a very large, imposing car and the competitive set in the day included Packard and Pierce-Arrow. They were well-engineered and basically overbuilt. The engine is a massive 12.8-liter straight-six making a then very impressive 90 horsepower. 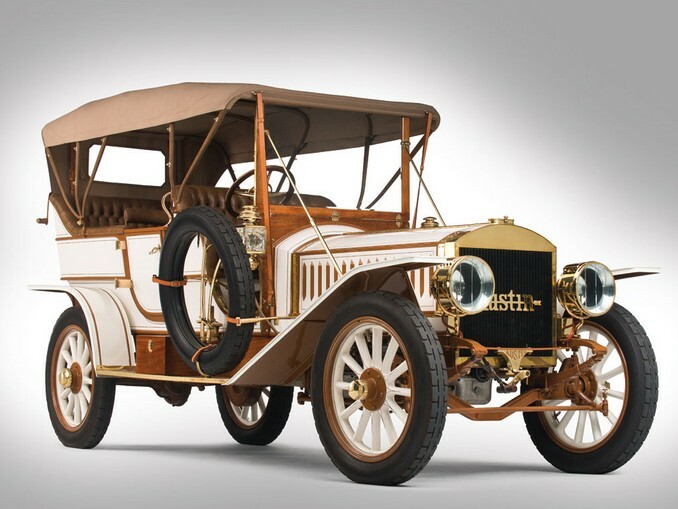 This particular car was featured on the Austin stand at the 1909 Chicago Auto Show. The first owner bought it off the auto show stand for $5,000 and kept it for 38 years. It was then sold to Barney Pollard who maintained the car throughout his ownership. It spent 30 years in a museum during this time before the current owner bought it in 1983. The car has been restored, but because it was cared for its entire life, it has many (if not most) of its original parts. This is the only Model 60 in existence and the finest Austin there is. It is expected to sell for between $500,000-$750,000. Click here for more info and here for the rest of RM’s lineup at Amelia Island. This entry was posted in Uncategorized and tagged 1909, auctions, austin, cars, classic cars, model 60, rm auctions, touring by ClassicCarWeekly. Bookmark the permalink. We’re up at the Concours all weekend – and its been great so far! Been enjoying your blog posts as well – keep up the good work. I hope to get my own up shortly! Sounds fun… wish I was there… instead of shoveling snow!